You have no idea how good it feels to finally take time in this crazy schedule to come here and write a little, share a recipe and possibly a good laugh or two. Although now that I am here I am drawing a super "ugh" kind of a blank. Yes, even that brilliant paragraph I wrote in my head this morning in the shower. Pouf! Gone. I am seriously thinking of designing a waterproof notepad or carrying a waterproof in there. - Tell me what is the most raved about dessert you have made (please provide link to recipe or as many details as you wish) in the comment section of this post. No need to have a blog, just the main idea of the recipe. (No anonymous without a name will be approved). - On Monday night, I'll pick one I know my better half would love for his birthday, make it and post about it, (with full credits to you and the recipe of course). Hope ya'll can hit me with some major sweetness! And anything goes: the man likes everything, ahaha! And I am ok with losing my mind over this... it's the season after all and I admit I absolutely love it. Well, apart from not being able to cook and post as much, answer emails on time, and piling up clean laundry instead of folding it. Why am I telling you this? 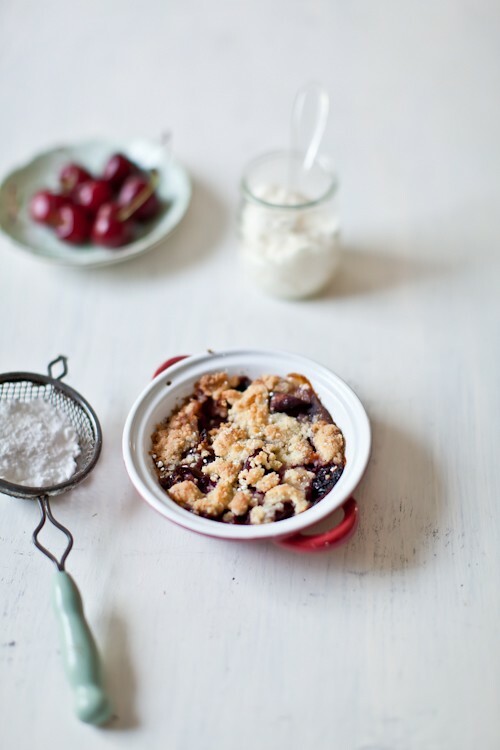 It all relates to these Cherry And Plum Crumbles and how I need a mini "brain check" before bedtime lately. I was all set to make cherry and plum sorbet the other day when I realized I may not have picked up enough of each at the farmers' market and I was about to head out the door for more, B. shouted from the garage that his mom was stopping by with extras from her market trip "she thought you might like more plums and cherries". What did I hear instead? The tiny influx of rush and stress of my own mental notes but not a word he said. I started thinking I should pick some flowers for his mom as a thank you. That I'd better not lolligag while at the store, get my stuff and jet. My mind drifted and wondered if I'd have time to churn that batch of ice cream before bedtime. I thought about the vet, the delivery guy, the dentist every one in between! It felt crammed up inside my head. Have no fear, I am not driving while under the influence of the voices. The car seems to be a free zone. I got home right on time to invite my mother in law inside for a very cold glass of lemonade and a few cookies. We unloaded our bags together and busted out laughing right away. I was staring at enough cherries and plums to feed the whole neighborhood. I've always considered this kind of happening a joyous opportunity to poach extra fruit and freeze them for when I crave cherries in January, plums in November, or ripe and juicy pears in June. Poaching fruit in a concoction of lemon juice, water and spices is something I learned from my mom and grandmother very early on. It used to generates suspicious looks from my husband when we were newlyweds and he'd come home to find me elbow deep skinning and pitting a box of bruised peaches for poaching and freezing. Why not can you might ask? I make jams regularly so I am running out of room already in the pantry and I go through the frozen fruit faster than the jams. I had enough fruit this time around to make cherry and plum sorbets, poach and freeze some and make Cherry Plum Crumbles with the rest. That's a lot. Even if it's summer and it is bloody hot outside, I still went ahead and made crumbles. I needed to plan comforting treats for the busy day ahead. The mix of crunchy bits of dough and soft fruit all warm out of the oven topped with a generous scoop of ice cream is my idea of the ultimate comfort. I am too ticklish to get a massage. I am too claustrophobic to enjoy a facial. Not girly enough to go for mani-pedis. So crumbles it is. Curled up on the couch, passed midnight, the pups next to me. Preferably with a side of summer rain but without is alright too. In a large mixing bowl, combine the fruits with the honey, lemon zest and juice and cornstarch. Toss with your hands to coat the fruits evenly. 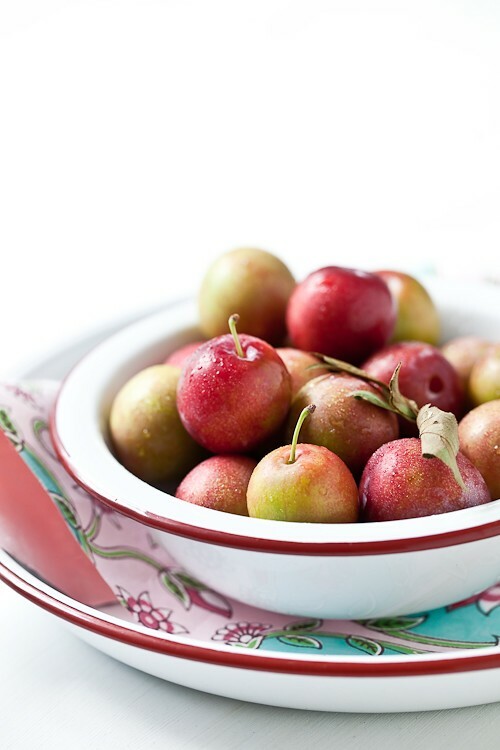 Divide between 4 to 6 ramequins and place them on a baking sheet lined with parchment paper or foil as the fruits are most likely to release their juice, causing a spill. Set them aside while your prepare the topping. In a medium bowl, toss together the sugar, millet flour and cardamom. Add the butter cut in small pieces and mix with your fingertips until you get a mixture that resembles coarse crumbs. Divide th topping evenly on top of the dishes. Bake for 20-30 minutes or until the topping is golden brown. Cool to room temperature. Cover and refrigerate until cold. Process in an ice cream maker according to your machine's manufacturer's instruction. Freeze until firm. You certainly made lots of goodies with all of your fruit! We too love poaching fruits and preserving them for later delight! I LOVE the sounds of this crumble and goat cheese ice cream is new to me but I know I would fall in love, Im already dying to make it! Im sure whatever you make your son will be wonderful! and lovely giveaway!! P.S the waterproof notepad would be genius! Of course I have to suggest a dessert for two! It's so romantic! The recipes I hear the most praise for are my pineapple upside down cake (a great Southern classic that just screams birthday with the cherries in the middle of the cakes!) Or what about chocolate cream pie for two? Ok, that's my favorite so far. Jennifer: I love your idea. I must rectify that Bill is my husband though, we can't/don't have children. My husband LOVES the raspberry blackout cake from vegan with a vengeance. I've only fed it to omnivores, and everyone requests it again and again. I'm so intrigued by the goat cheese ice cream! Most recently, the most raved about item I've made is David Lebovitz's Salted Butter Caramel Ice Cream http://www.davidlebovitz.com/archives/2007/04/salted_butter_c.html. Glad your spirits are up finally. I also celebrate birthday next week but a day earlier. So I would like to share an idea I am going to put to life myself. And borrow your goat cheese ice-cream idea. This is a cold dessert and it can be called Russian panna cotta with the exception that you use sour cream instead of cream and, as you understand, there is no need to boil it. This dessert comes from my childhood by the way. I remember having it regularly in a "Snowflake" cafe after my mum took me from the children day care centre after work. It is creamy, rich and slightly tart and good for hot days. We call it krem-smetanka (krem = cream, smetanka = diminutive for 'sour cream'). I cannot give accurate amounts of ingredients because I am only trying to reproduce it myself some 25 years later. Yesterday I tried making a test batch and found out that 2 teaspoons of gelatine per one cup of dessert is way too much. It should be just barely set so for a 30% fat sour cream maybe you need only half teaspoon? I am going to repeat it with less gelatine and make it layered with chocolate in verrines or top with puréed fruit mousse - everything I learned from you. Alternatively, I think of making chocolate moulds and topping the krem-smetanka with fresh berries. There is room for imagination! A friend came over and brought dessert the other day - mini chocolate pavlovas (with chunks of chocolate), served with cream and fresh berries. Make a black forest cake!!! Maybe you can use all this fresh cherries to make a compote to go with the filling. Do a Mascarpone cream (whipped with some icing sugar and vanilla extract), and a chocolate praline mousse for the filling. The rich Mascarpone with a luscious crunchy chocolate praline sounds very indulgent to me. Hope you guys enjoy the birthday. those look wonderful! i love fresh cherries! one of my most praised desserts has been a peanut butter chocolate cheesecake--yum! I've never thought of poaching and freezing fruit... What a great idea! I am bad about buying more than I can eat. It always looks so good... It's so hard not to! I made a chocolate and peanut butter cake a few days ago that my family went nuts for. I posted the recipe here. Goat cheese ice cream sounds so intriguing! I would absolutely love to try that as I have tons of goat cheese in my fridge. If he is a chocolate freak like some of my friends...I would make a nice big chocolate cobbler. Serve it with a big scoop of french vanilla ice cream and you will have happy guests! Good luck with your big decision! I hope you don't mind if I provide you two recipes, because I'm so torn as to which one is my favorite! My most raved about cake ever is my blackest forest cake (recipe here), which has layers black cocoa chocolate cake, dark chocolate ganache, dark cherry filling, and mascarpone whipped cream. But, for my own birthday recently, I went with something more summery: a lemon and raspberry-lime layer cake (recipe here), with raspberry-studded lemon cake, lemon and raspberry-lime curds, and raspberry-lime buttercream. I'm still hearing about that one even though my birthday was a month ago! Happy advanced b-day to Bill! This one is fantastic! I made it before I started my blog so I don't have any good pictures of it. It's worth the trouble, trust me. Happy Birthday! I'd love to get my hands on that goat cheese ice cream! I used greek yogurt and it was wonderful, and I would suggest that if you decide to make these and plan to unmold them that you use a bit more gelatin than they suggest, especially if you don't plan to refrigerate overnight. I'd recommend a strawberry and mascarpone cake (more like a dessert). It has layers of chewy meringue with coconut, then a mascarpone mix, then strawberries and repeat. The top is devine, another meringue disk, sprinkled with icing sugar which it then blow torched, like a creme brulee. Always wins many compliments! Here is my most recent effort from a work bake-off competition! Below are links to two different recipes - compliments to the two Australian chefs Neil Perry and Lorraine Godsmark for the two recipes. I use Godsmark's for the ingredients and Perry's for the technique (with the exception of the blow torching which is from Godsmark's recipe). Mmm, I love me a fruit crisp. When I found pluots at the market a few weeks ago, I assured the vendor that I would just top them with crumble and bake them for my husband to gobble them up; I was right. I too have a summer birthday and have always hankered after the amazing sounding Scandinavian Cloudberry Cake, but as I've not been lucky enough to come across a cloudberry in England, it remains a tantalizing mystery yet to be discovered. Nevertheless berry cakes are one of the perks of a summer birthday and I recently concocted a raspberry and white chocolate cake with macadamia streusel topping for myself. (I think these are known as crumb cakes in the US.) And, even though it's summer, I like to eat it warm, accompanied by cold, cold crème fraîche. The thing that gets the most comments from my friends when I make them are my Mexican spiced chocolate brownies (recipe here (at the end)). Everyone is expecting an innocent little chocolate bite, but what they get is a deeply chocolatey flavour with the warmth of chilli, cinnamon and nutmeg. Wonderful warm with vanilla ice cream. I have on occasion added in some fresh raspberries - I love their flavour with good chocolate. That particularly brownie recipe also features virtually no flour at all, so I'm sure would be pretty simple for you to convert to being gluten free. Happy birthday to your husband! I have a birthday cake to make for a friend next week too, and am dithering about what to make - the brownies are out because I have a girl allergic to chocolate staying with me. Oh noes! We're still in the middle of a brilliant summer fruit season down in the far south west of England though, so I'm sure I'll find something! My parents have a prolific worcester berry (a cross between a blackcurrant and a gooseberry) bush in their garden, so I'm going to make a cheesecake. Debating whether to make something else as well though! This tiramisu is a real crowd pleaser. i think the brandy in the zabaglione instead of marsala. To make the zabaglione, you need to whisk the egg yolks, sugar and brandy in a bowl over a saucepan of simmering water until thick, then remove from the heat. Keep whisking even after you remove the bowl from the heat. You can stop once it cools down, otherwise it will start to 'cook' and go clumpy. In another bowl, whisk the mascarpone until it's soft and then fold in the cooled zabaglione mixture. You will need a deep round (preferably glass, to see the pretty layers) bowl to serve it in. Arrange half the sponge finger biscuits over the base, then sprinkle half the coffee and half the chocolate over the biscuits. Spoon in up to half of the zabaglione/marscapone mixture and spread it evenly over the biscuit layer, then repeat until you fill the bowl. Sift cocoa over the final layer and sprinkle with the remaining grated chocolate. For best results, refrigerate this at least 2 hours before serving. If you prefer a creamier tiramisu you can fold some whipped cream thru the zabaglione. This looks delicious! Your photos are perfect! THIS cheesecake :) do it! How about a Birthday Pie! This Original Shoo Fly Pie is fabulous. It's something a little different...and with a dollop of a great vanilla bean ice cream! WOW! Love the goat cheese ice cream idea. I just posted goat cheese brownies. Yum! 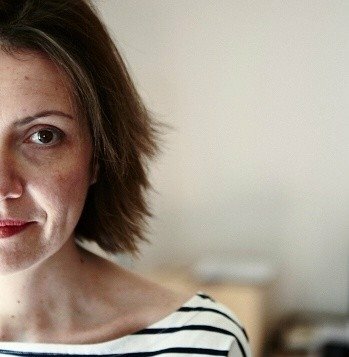 Love your blog and your beautiful photos! I love stone fruits!! 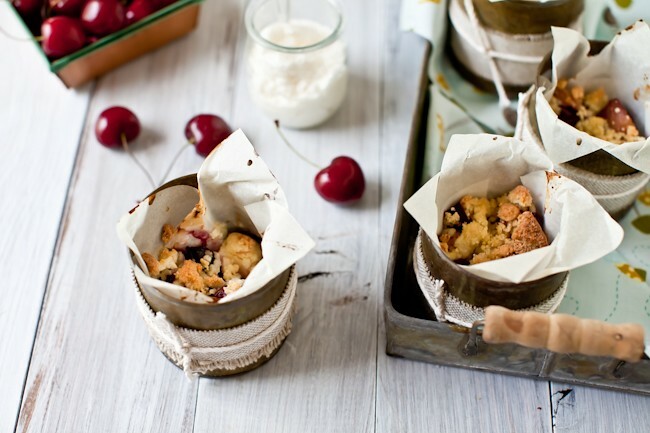 Cherries and plums are always great for dessert! Goat cheese ice cream sounds fantastic! This is hard. My most requested dessert are coconut cupcakes from Lisa Yockelson. These aren't ordinary. I've made them at least 20 times in past two years. We are so obsessed with them, a few are always sitting in freezer. I've put them on my blog twice (something I never do). it's a flourless chocolate cake with a hazelnut meringue on top. it's a hit every time, altho it is a several step process to get to the finished product! I made the best dessert I have ever made yesterday - my mum said it was the best thing she's ever eaten. Maybe it will tempt you too! It's a vanilla baked custard base (like creme brulee) topped with strawberry syrup with a hint of lemon and foraged wild strawberries - see http://www.poiresauchocolat.net/2010/07/une-douce-pour-lete.html. As wild strawberries are hard to come by, I think cherries or blueberries would be a good replacement. I must admit though that the cheater caramel sauce included in the recipe is not always reliable for me. Sometimes it works, sometimes it doesn't. I'm going to replace it with one that always works soon. But I'm sure that won't stop you since you make lovely things with caramel all the time! Happy Birthday to Bill! I always bake Barry something chocolate. Although these days his second favourite thing to request is a toffee nut tart (Engadinger Nusstorte). I can't wait to see what you end up making. These crumbles truly do evoke a feeling of comfort. I can imagine curling up on the couch, with a bowl of this warming my hands. I like the pair of cherries in the first photo - they look like a little heart. As for Bill's birthday, I have a couple of ideas to add. Have fun with whatever your creation is and wish Bill a very Happy Birthday. THe strawberry layer cake from Cooks Illustrated is to die for. Very beautiful and delicious. Love your pics and blog. Topped with fresh raspberries or blackberries.....SOOOO delicious! I had never heard of such a thing before, but everyone I have served it to (including my children) have said it's the best cake they ever had! Thanks Helene, for the giveaway and such an inspiring and beautiful site! A very popular cake in my family is a Lemon cake from the Australian Women's Weekly Cookbook. It has yoghurt which makes it nice and moist, and you use the zest in a delicious syrup poured over the hot cake, which takes it from afternoon tea to special dessert. I just can`t stop see at these pics! Looks so delicious! Hi! One of my favorite crowd pleasers is vanilla cupcakes filled with a spoonful of Michele Anna Jordan's raspberry curd, topped with a generous dollop of lemon buttercream frosting, with a sprinkling of coarse sugar on top! Oh gosh, Helene, are you sure you are ready for all these suggestions? For the birthday cake, in Norway, we traditionally make a "Bløtkake", a sponge (biscuit) base with whipped cream and berries (the Norwegians prefer Norwegian strawberries), then topped with first a layer of whipped cream, then cover the whole cake with rolled marzipan. Bring the wine and seeds and pulp of the passion fruit to a boil in a saucepan, then take off the heat and stir in the sugar. Pour through a sieve into a glass measuring cup to strain, discarding the seeds and pulp. Soak the gelatin in cold water until soft, then wring it out and whisk into the strained liquid. Pour the mixture two glasses (I usually use smaller glasses and make about 4 out of this recipe) and put in the fridge to set. For the cream, put all ingredients into a bowl and whisk until fluffy. Dollop onto each jelly. I hope he has a wonderful birthday...I'm sure he'll enjoy anything you make for him! I submitted it for a contest that the Foodista website was having for a cook book. You can substitute any nut or make any crust that you like. I hope you will try this even though it may not be for your hubby's birthday! Another favorite is this chocolate cobbler, which is sort of like a lava cake. I replace some of the cocoa with coffee to make it a mocha dessert, and top with vanilla or coffee ice cream. my starter went out on my fridge (the tech guy thought it was something else-therefore too late to save everything). thus, frantically making everything i can to save the provisions! i have some fresh-frozen cherries. think i am going to have whip this up for tonight. thanks for the inspiration! I'm not sure if they're really birthday-worthy, but Deb's car bomb cupcakes are incredible. I made them for St. Paddy's and people are still talking about them this weekend, four months later! Chocolate Praline Layer Cake. Oh, mama. It is to die for...it is to live for! The recipe calls for a box mix but you could use your favorite chocolate scratch cake recipe. Vanilla ice cream with pear/apple caviar and syrup of liquorice root. Recipe is in Danish, but Google translate should do an okay job. If not, let me know, and I will translate it for you. My second idea is this tart: http://jakbulkazmaslem.blogspot.com/2010/02/posturodzinowo.html I made it for my own birthday, but actually I took the recipe from lottei&doof, so I am not sure if that counts. I would have to say a white white chocolate tart-- that being a white ganache inside a (white sweet pastry dough). 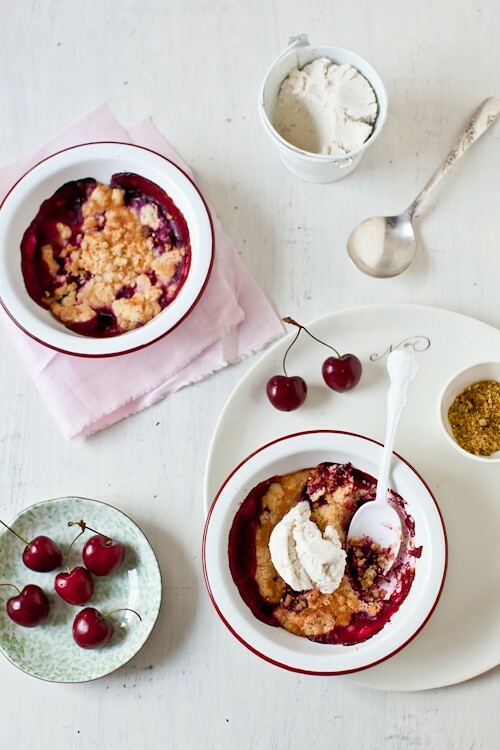 Served with a sour cherry jam or compote, it's a light and delicious summer dessert. Whatever you make, hope you both enjoy it! This is our favorite! It's so,so simple, but SO delicious! Every time I serve it (over vanilla ice cream), people LOVE it! It's from Barefoot Contessa's Family Style book. Simple but absolutely yummy - chocolate crepes (room temp)folded in half and then in half again, slice some fresh fruit (in December, pears are amazing) and then drizzle on some warm caramel sauce. This has been a huge hit in my family for years! Chocolate Truffle Tarte! I make a chocolate pecan crust (ground pecans, flour, sugar, cocoa, & butter) and fill it with a dark chocolate truffle filling. I top the tart with lots of fresh raspberries and white chocolate curls. the best dessert I have ever made and tasted comes from your website. It's the pistachio and strawberry mousse mille feuilles. I didn't get the mille feuilles as well as yours but the marscapone cream were amazing. Most of the desserts I make were good, but that was unforgettably good. Thanks for your generosity in sharing all your carefully written recipes with us. Andrew's Mom: yep, know that one...one of the first Daring Bakers challenges actually! i've never gotten as many raves as my dark chocolate and caramel cheesecake with a chocolate cookie crust. brings plain ol' chocolate cheesecake to another level. My absolute favorite cake to make (especially for birthdays) has to be Chocolate Guinness Cake. Nigella Lawson's recipe is simply irresistible. The cake resembles a pint of Guinness with it's dark, chocolatey color and smooth cream cheese frosting that's piled on top! I must suggest this decadent s'mores pie I made for Pi Day. The crust is buttery and salty, topped with a rich chocolate and stout beer filling and then a homemade marshmallow topping. Just before serving, toast the marshmallow with a creme brulee torch. It's an indulgent and rich version of the campfire classic. Everyone loves this one and I get requests for it all the time! I have not made it this summer yet, other wise I would use fresh raspberries rather than preserves. I have been meaning to blog this recipe a while, but for now, here is a simple tasty kitchen recipe without even a photo. This is really easy to make gluten free as well, especially since I am fairly certain that you already have a gluten-free puff pastry recipe! I am a sucker for the classics. This yellow cake with chocolate fudge icing haunts my dreams. Could be a dreamy birthday dessert! Helene, I have a great idea...it is called a Zebra cake, it is a family favorite and truly melts in your mouth! The real plus is that it is sooooo easy to make, looks extravagant and is very unique. I use the receipe on the box with one minor adjustment, I put the cake once it is made in the frig for two hours then put it in the freezer covered with wax paper for at least 4 hours and I don't let it thaw before serving! Hope you and your Hubby have a great celebration!!!! Love the idea of using goat cheese. I am so excited to try this one out. Your photos are amazing. Thanks for the inspriation. I liked your coconut ice cream so much I thought I share with you my favorite homemade ice cream, fresh mint ice cream with chocolate chips. steep overnight in the fridge; strain out leaves. yellow, 3 to 5 minutes. Return milk to a simmer. bowl in ice-water bath; chill. Stir in chocolate chips. 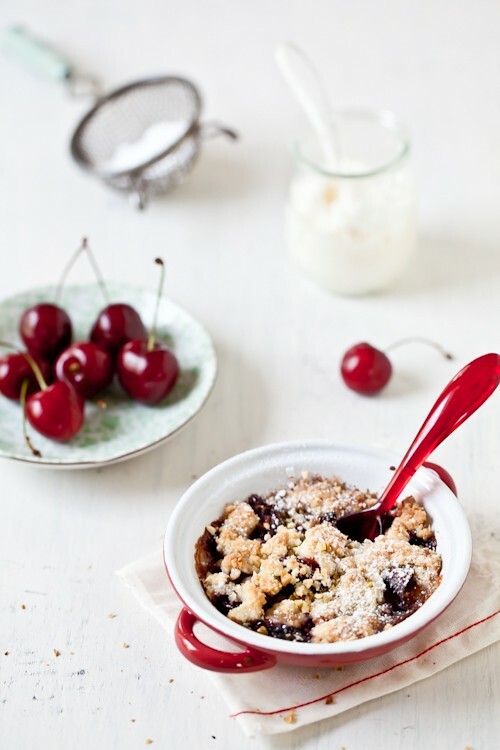 I love the combination of cherries and plums in this crumble. It looks so delicious. I've never had goats cheese ice cream before. It would definitely be interesting to try!! I made a strawberry rhubarb galette with balsamic and pepper last week that had everyone raving for days. I would go for something French, like a fraisier or framboisier, or some choux a la creme. How about some passion for B on his birthday? My favourite sweet treat is a passionfruit marshmallow slice - it has a pastry/biscuit base with a topping made with passionfruit pulp, white marshmallows, lightly whipped cream and some lemon juice to provide some tartness and is truely orgasmic! I make a dessert called Hot Fudge Spoon Cake, which is both humble and lazy, but my husband can't live without it. You spread chocolate cake batter into a greased crock-pot, pour a mixture of sugar, cocoa, and boiling water on top, and then plug it in and forget about it for two hours. The cake rises to the top, the sauce sinks to the bottom, and you serve it with scoops of vanilla ice cream. it's a japanese strawberry shortcake, so instead of a biscuit, the dessert uses a sponge cake. also, instead of kirsch, i use triple sec (so i think any alcohol will do). this cake is SO popular in japan because it's so light from the sponge cake and whipped cream but you still get the sweetness from the strawberries! but whichever recipe you go with, good luck and happy birthday to your husband! i've never made it for anyone that didn't loooooovvvveee it. And it's not really a pie... since it's huge and in a spring form, but here you go! melt chocolate in double boiler and let cool to room temperature. whip cream with pd. sugar until soft peaks form. add whole eggs to chocolate mixture and mix well. add egg yolks and blend. stir a little whipped cream and a little whipped egg white into chocolate mixture. fold remaining whites and cream into mixture until completely incorporated. turn into crust and chill at least 6 hours, preferably overnight. Top with one pint of whipped cream, sweetened with 1/2 cup powdered sugar and 1 t. vanilla. add fresh fruit to garnish if desired. Take chocolate bar and then *peel* it with your potato peeler to make choc. curls for the top of your dessert. There are 2 things on my blog that my hubby really loves and everybody who has tried it before definately raves about it. 1. Longan tofu, which is a soy milk based jelly set with agar powder, and flavoured with canned longans,but you can definately switch the fruit. Very cooling to eat on a hot summer's day. 2. Strawberry Mirror Cake, a Daring Baker's thing way back during the early times, I'm sure you must have tried it too. Beautiful pictures.I find a tiramisu the best gift for any birthday. I like the original recipe but I once tried it with strawberry and it was so delicious. This is the link to the original recipe. Hope you find the perfect "gift" that suits your husband's birhtday. I don't think I have just one special dessert - rocky road cheesecake, cream brulee, creme caramel, baked banana cheesecake but probably the one I make the most is a pavlova! I look forward to seeing what you decide. The birthday cake to make - Chocolate Raspberry Truffle Cake ! A good marriage - Chocolate & Raspberry. I use 55% dark chocolate. It's a rich, chocolaty to die for cake and the raspberry puree cuts the richness at the right place. My husband's birthday is in Oct and I wonder whether he will ask for the same cake 3 years in a row ! Happy Birthday to your husband and Many Blessings to both of you. I love some kind of frozen pound cake with layers of goat cheese ice cream, and fruit. Yummy. The cake is moist, decadent and overwhelming, but in a very good way! Last year for my birthday I made a Guinness Chocolate Cheesecake with Bailey's Whipped Cream (yes, I made my own birthday cake). it got rave reviews, and I think you might actually get some lovely pictures out of it. Here's a link to the post I did on it. 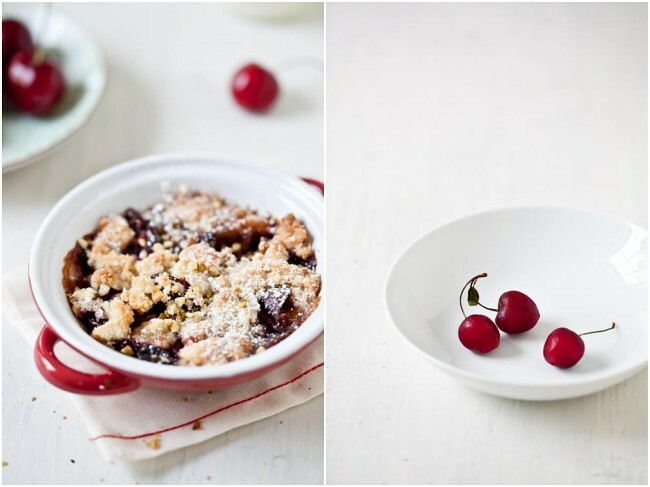 I've been dreaming about all the gorgeous cherry recipes around my favorite blogs and have been saving them for later on this year, when cherries are available. I'll be giving the crumble a try, Helen! Gorgeous! A-M-A-Z-I-N-G. I get requests for the recipe every single time I make it. And you can halve it and make it in a loaf pan too (if it's just for 2). Helene, a significant other's Bday calls for something rich and decadent, something you may not want to eat or make for just a dinner dessert. What I envision is a warm individual chocolate cake, topped with a chocolate mousse, fresh berries, a warm vanilla sauce dripping over the whole thing and a little chantilly on the side. I like the mix of warm components and cold components together. Anyhow.....good luck picking the perfect dessert, I am sure whatever it is, it will be fabulous, can't wait to see the pictures. Helene, thank you for your blog-I love it! We too live in a pretty warm part of the country--it's 7:27am and 101 degrees as I write--and our latest favorite hot-weather dessert is coeur a la creme, slightly adapted from Anne Willan's recipe-- 2 cups homemade creme fraiche lightened with Italian meringue, based on 2 egg whites and 3oz sugar, with fresh berries. I'm a little nervous about raw eggs in this weather, hence the change. Best wishes for the special day! Have you ever made Giada's Nutella Ravioli? YUM! One of my family's favorites is the chocolate banana cake. It's basically layers of chocolate sponge cake and light chocolate mousse stuffed with banana slices and the whole cake is covered with chocolate ganache. It truly is one of a kind! We used to get it from a bakery back when we lived in Asia but we have yet to see it in bakeries in the U.S. I have tried to replicate it but I haven't got it quite right yet. However, I'm sure you could create a wonderful version of it for your husbands birthday! Here's a link to a picture of the cake in case you didn't understand my description :P.
This is the simplest of recipes. It won't sound all that interesting, I know. It's strictly a summer thing and works brilliantly with a complimentary dessert partner (like a lemon curd tart, or a simple panna cotta) or as a palate cleanser or even as a sort of slushy apertif when dressed with a little limoncello or hendricks gin or just clean vodka and served in a little dessert dish with a spoon. There is some sort of beautiful herbal alchemy going on that is so refreshing and enchanting. I make this quite often in the summer when I find lemon verbena in the farmers market. It's so simple -- you can make it in minutes. And my friends are always delighted. Last year I made coconut avocado ice cream. I know it sounds weird since it has avocado, but its quite delicious. I have had a lot of compliments on the dessert. But I ususally let people eat it before I tell them what it is. Ha! By the way, I love the utensils you use in your shots. Where did you find the while spoon? And it the plastic spoon a baby spoon? My favorite cake to make in the summer is Strawberries and Cream Sponge Cake Roll. I made it about a month ago for my husbands birthday. It is so light and creamy. Mmm mmm mmm. I wish I had a piece now to eat now for breakfast. Enjoy! Hands down my favorite cake of all time---Nathan's Lemon Cake by Cooking Light. The combination of the moist lemony cake with the lemon frosting is AWESOME. I'm trying to get my nerve up to try macarons!! Have fun choosing the winner! I am sure there will be some great recipes. I'm crazy for dessert making, so I get a lot of raves because I put a lot of practice in ;) but the one that got the best response, out of all of them, is my brother's recipe: beer pie. Its a chocolate refrigerator pie in a graham cracker crust-marshmallows and chocolate chips go in the blender. heavy cream and stout or porter are heated separately and poured in the blender. Everything is whirled together until homogeneous, then add bourbon to taste and blend again before filling the crust and refrigerating for at least 4 hours. I make a blackberry lemon triffle that is comprised of fresh blackberries, sour cream pound cake and lemon curd mousse. Its light, sweet, lemony and oh so good when its hot. I'd love to share my recipe with you, even if I don't win! Leave me a message on www.fabfisherfamily.blogspot.com if you're interested! The best dessert I've made lately was from Sprinkle Bakes - no-bake white chocolate cheesecake. I made mine into individual servings in nice glasses (no individual springforms), didn't color any of it with the red food coloring, and topped it with a barely-cooked fruit topping. Blueberries, raspberries - whatever you've got. Cherries would be excellent! My 6-yr-old son doesn't like "cheesecake", though, so we had to call them "parfaits". He gobbled it down!! Good luck finding an excellent dessert!! Lots to choose from! I don't have a recipe.. I just want to say that I love your blog! Your recipes are great and the pictures are beautiful! My most raved about dessert is your caramel cake. The dessert I make that everyone raves about is Chocolate Angel Food cake from the Cake Bible by Rose Levy Bernbaum. I wanted to say thank you so much for the wonderful recipes you keep sharing on your website. I made my first ever macarons using your recipe, and they were a hit! Served chilled, these are perfect for a midsummer night's dessert! Any buttercream works. For the one in the pictures I used an Italian buttercream. And use as much irish cream as you can get away with! The first is lemon-swirl cheesecake, a classic creamy cheesecake with tons of lemon curd swirls in it, and served with sugared strawberries. I make it for a friend of mine who has severe food allergies (the only fruit he can have are citruses and strawberries.) My best friend, who is a huge foodie and my cooking idol, after tasting it told me, "You make a damn good cheesecake." The second is a vanilla-bean cardamom pound cake. The original recipe was tweaked to make the cake a bit moister, but I've have had a number of requests for this cake after bringing it to a potluck. I serve it with whipped cream (with brandy, of course) and that became a huge deal after other grad students I work with learned that whipped cream doesn't actually come out of a can! strawberries that had been macerating in sugar & balsamic vinegar. A flourless chocolate cake topped with fresh raspberries! The dessert that everybody raves about is a light passion fruit mousse, with caramel, orange and passion fruit sauce. My recipe is in Spanish, but I can gladly translate it for you. Goat cheese is such an amazing flavour in desserts! I once made a batch of Beetroot and Goat Cheese macarons that were beautiful and delicious which my friends loved, he may like those? But the dessert my family loved the most was definitely sticky date and dried apricot pudding with walnut crumble, white chocolate ice cream, creme fraiche and honey caramel. And it was gluten free!! Amazing. Jessica's Tart from Sunday Suppers at Lucques is my go-to dessert! Helene, this is one of my favorite posts that you have done. The plating, tones, and composition are just perfect! Perhaps you could try a flan cake? (Flan is a traditional Mexican dessert.) Last time I made this, I served it w/a fruit salad of strawberries and mangoes and a bit of lime juice. Melt ½ cup of sugar w/1tsp of cinnamon. Pour into a glass pan (~2 quart capacity) and swirl to coat bottom. Set aside. Beat 6 eggs, one at a time, into 8oz of room temp cream cheese. Add 12oz of evaporated milk, 14oz of sweetened condensed milk, and 1tsp of vanilla (or coconut/almond/etc.) extract. Strain mixture through a sieve and into the glass pan w/the caramelized sugar/cinnamon. For the cake: Sift together a cup of flour, 1/4 cup of sugar, 1tsp baking powder, 1/4tsp of salt. Add 3 egg yolks, 5 Tbsp of oil, and 1 Tbsp of vanilla. In a separate bowl, beat three egg whites w/1/4tsp of cream of tartar until foamy. Add ¼ cup of sugar gradually and beat until stiff peaks form. Fold this mixture into the egg white mixture and carefully float it on top of the flan mixture. Place the flan dish in a larger dish and put enough hot water in the larger dish so that it comes halfway up the side of the flan dish. Bake at 325F for ~1.25 hours. Let cool in the fridge overnight (IMPORTANT!!) To serve, invert the flan cake and scrape any remaining caramel sauce over it. What about a croquembouche? Choux puffs (original or flavoured), toffee, a variety of creme patissiere (choose Bill's favourite flavour(s)), and a decoration of some sort. It's festive, looks good, tastes good, and the individual components are easy to make. Though putting them together is pain-staking, I think your husband will appreciate your efforts in making it. facades.of.emotions: could have worked except it's not the right time for us with 115F and 100% humidity. I'm steering away from caramel. Thanks to everyone for taking the time - if there is a recipe you really want me to read, email it to me (see about page for email address) - I promise to read it! Just made a wonderful cake, not posted yet: an italian almons chocolate torte (from Alice Medrich, recently posted by Y), topped with a thin layer of caramel bittersweet chocolate mousse, a layer of yogurt white chocolate pana cotta with vanilla and plum pits roasted plums and another thin layer of caramel chocolate mousse. Hope you will find the best dessert for Bill. I always start posts in my head in the shower and then forget! I have to stop myself once I start thinking of one or I know it will be gone forever. All of your recipes tempt me so, but my fiance is completely obsessed with plums and cherries, so we constantly have them in the house. I am definitely intrigued by the goat cheese ice cream too - how long does it usually keep? For the birthday treat, I have been making devil's food cake from bon appetit with a layer of chocolate pudding on top for the past five or six birthdays and it's always a hit. But you make the most delicious cake, pies, tarts, and cookies, so my suggestion is something a little different: gulab jamen. I don't have a recipe up myself, but they are balls of dough that you fry and then soak in simple syrup. They are a-m-a-z-i-n-g, but I am not sure if you can make them gluten free. I'm not sure if you are making something gluten-free for this occasion, but rasmalai is my favorite Indian dessert, and I think that can be made gluten free. Refreshing, creammy, and gourgeous with the cherry sauce. (so far my blog is only in Spanish). Happy birthday, Bill and have a great day both of you. Goat cheese ice cream? Where has it been all my life?! As for the dessert, this time of year I would probably make a simple cherry pie with flaky crust and vanilla bean ice cream. I might even serve it with stracciatella and coffee from the local gelatria. Beautiful. Absolutely gorgeous. Look at those colours! Hm, goat cheese ice cream. Sounds. . .creamy, I never envisioned goat cheese in ice cream, but I can see how it would offset the cherries perfectly. Good job! How about a moist carrot cake with pecans and raisins and rich cream cheese frosting? Karina Allrich (gluten-free goddess blog) has a delicious recipe that has all that plus coconut. I hope Bill has a great birthday! I always ask my sweet husband what he wants baked for his birthday. And it is always the same answer: my whole wheat fruit cake, made with dried fruit. So I bake a fruitcake every June, as strange as it seems to me! And I bake it again in December for Christmas. Stone fruit verrines ...sorry this is late, but I just made them from yr blog! They were excellent!! Delightful summer's crumbles & that goat's ice cream looks the best!! MMMMMMMMMM,..An over the top dessert! Waw! Being that it is both cherry and plum season and our plum tree is laden with luscious fruit, I decided to make this last night. The combination of the goat cheese ice cream with the crumble is divine. Both are extremely easy to make and so delicious. The ice cream is going to be a new favorite of mine. Everyone loved the dessert. Thank you.